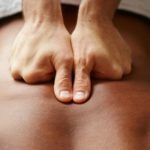 Your custom massage may include aspects of the following massage techniques. The most common massage therapy technique is relaxation massage. A relaxation session includes classic Swedish massage strokes. The massage therapist will use light to medium pressure, depending on the client’s preference, and the intent of the session is to help the client relax and reduce stress. This type of session may retain a large relaxation element to it but advanced techniques are likely to be used for pain and chronic health issues. The massage therapist may advise a client to set up more frequent massage sessions for the first few weeks or months. Advanced techniques and a variety of other modalities and pain control products or Essential Oils may be used for stress relief and to help relieve symptoms of more chronic health conditions. Myofascial release is a safe and very effective hands-on technique that involves applying gentle sustained pressure into the myofascial connective tissue restrictions and scars to eliminate pain and restore motion. Each session is performed directly on skin without oils, creams or machinery. Chair massage is a style of seated massage that is typically short — 10 or 15 minutes — and focuses on your back, shoulders and neck and arms. Chair massage is done over clothes and doesn’t require any massage oil. You are seated in a special chair with your face resting in a cradle, looking down towards the floor, with supports for your arms. Your back and neck completely relax while the therapist relieves muscle tension using Swedish massage moves like kneading and compression and tapotement. A vibrational sound treatment may be added onto any of the previously mentioned massage methods to assist the client in releasing muscular and stress related tension. The tuning forks used for these treatments have unique spiritually based frequencies that promote relaxation, muscle release, energetic cellular balance and provide amazing results when incorporated with regular massage.